We discovered these wonderful, edgy and untraditional leggings at a clothing show in New York City. Although Anama is known for their tops and dresses, we fell in love with these leggings. These gorgeous leggings have swirls of studs and crystals on the legs. Perfect to wear with a black tunic. These leggings are absolute show stoppers! 92% Polyester, 8% Spandex. These leggings will become a staple of your wardrobe. 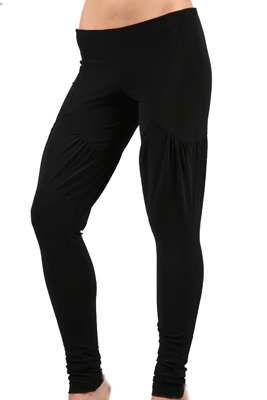 Not your traditional legging but with a "V" cut into the upper thigh with ruching on each side of the V. 92% Polyester, 8% Spandex.